Targeted to 8- to 16-year olds, Scratch allows students to create and share projects, presentations, stories and best of all – videos games! The emphasis is on multi-media and includes graphics, sound, music, and photos. Supported by National Science Foundation research, Scratch encourages creativity, problem-solving, and collaboration. GIRLSGOTECH.ORG is the Girl Scouts of America's effort to encourage girls (especially its membership) to explore technical fields. Playing the games and reading the profiles, history, and tips on the site may help some tween and young teen girls get excited about math, science, and technology. That said, there's not a lot of depth here. The external links pointing girls to other similar sites may help girls who are interested but run out of things to explore here find other related activities online. There is often a big divide between what happens in the laboratory and the way laboratory findings are practically applied. The relationship between neuroscience research and education is no exception. While there are numerous educational products that claim to be based on neuroscience research (often quite dubiously so), the real impact of brain-based research on education has been much more subtle. While neuroscience hasn’t yet radically changed the way we think about teaching and learning, it is helping to shape educational policies and influencing new ways of implementing technology, improving special education, and streamlining day-to-day interactions between teachers and students. 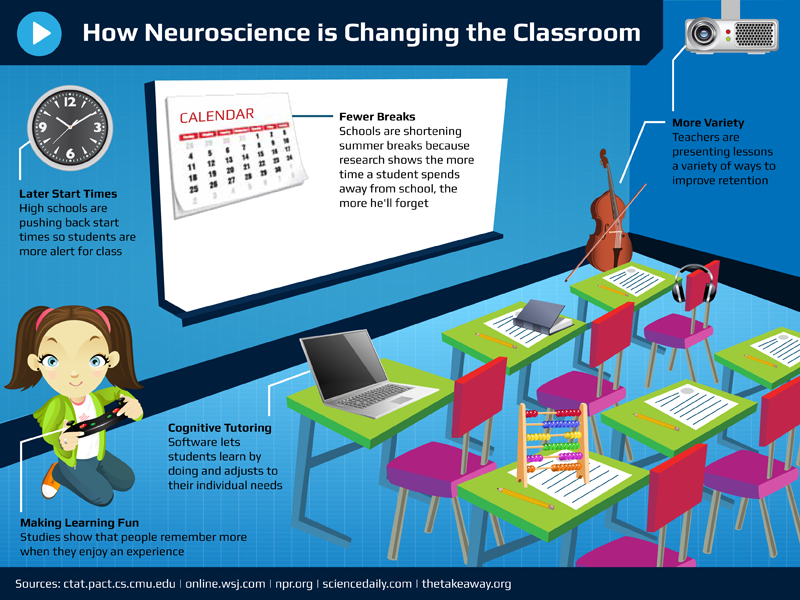 While there is still a long way to go before we truly understand the science of learning and how to use those findings in the real world classroom, it’s important to highlight some of the key ways that neuroscience is changing the classroom of today for the better. Cognitive tutoring is still in its infancy, but it is looking to be one of the most promising products of the intersection of neuroscience and education. Researchers at Carnegie Mellon are using their expertise in neuroscience and programming along with help and input from teachers to build software that’s both innovative and practical for everyday use. The first tutor created by the team focuses on algebra and has so far had promising results in helping students raise their math test scores. So how is it different from other tutoring programs? The cognitive tutoring programs allow students to learn by doing and are based on cognitive psychology theory, employing an AI system to adjust to student needs as well as to track student progress and thought processes so teachers can better help them learn. Read more about the tutoring system here, and learn how schools can tailor it to their individual needs as well. Neuroscience research has demonstrated that sleep patterns change, often significantly, as individuals age. Multiple studies have found that adolescents need more sleep than other age groups and are unlikely to function at peak cognitive capacity early in the morning. In addition to needing more sleep, teens also simply have different circadian rhythms, which often makes them drowsy and moody in the morning. Many schools are starting to use this data to make changes, pushing back start times to allow students to sleep in a little later. Surprisingly, as little as 30 minutes of difference can have a major impact on mood and attentiveness, and schools that have chosen to take this neuroscience research into account when making policies are reaping the benefits, reporting fewer students showing up late, skipping breakfast, and feeling sleepy throughout the day. Repetition can be a valuable learning tool, no matter what you’re trying to learn, but neuroscience research has pinpointed a “spacing effect,” demonstrating that students learn more when episodes of learning are spaced out over time rather than pushed into one single episode. One of the ways this manifests itself is by bringing greater variety into the classroom, with lessons extending over the course of a semester rather than being fit into a few days or weeks. Researchers have also found that variety is key in learning because, simply put, the brain craves it, boosting levels of both attention and retention in students. So how is this being put into practice? Teachers are presenting information in unique ways or asking students to solve a problem using multiple methods, not just memorizing a single way to do so. This same research has also debunked the idea that there are individual learning styles, suggesting that presenting information in a variety of ways is helpful to all students, not just those who enjoy more visual or auditory content. While our general brain anatomy is similar, neuroscience is showing that no two brains work exactly alike. Personal experiences actually determine where information is stored in the brain, developing unique neuron structures for each person. Because we’re all wired a little bit differently, learning tools that are adaptable to individual needs are especially valuable in the classroom. New, highly plastic digital tools are filling part of that role, but neuroscience and education are taking this information in another direction as well. Teachers are being encouraged to expose students to novel experiences when presenting information to build entirely new neural connections or to connect new information to previous experiences students have had to take advantage of existing brain pathways. When it comes to knowledge, you either use it or you lose it. Anyone who has ever tried to remember lessons from grade school decades later can attest to this, but neuroscience backs it up, demonstrating that people who read more challenging books often have a greater variety and number of neural connections. This research also has practical applications for modern education aside from simply encouraging students to read. Research has shown that the more time students spend outside of school, the more they’ll forget, leading to more work to regain lost information. As a result, many schools are shortening summer breaks or going to a year-round schedule in order to reduce the amount of time students are away from their studies. Neuroscience research is making it easier to identify which students have learning disabilities and to get those students interventions that can significantly help their academic performance. Through neuroscience research, new biomarkers and diagnostic strategies for disabilities like ADHD and dyslexia have been identified, in turn leading to more successful early interventions for students and some potentially amazing tools to help students learn. One example is a neuroscience-based reading program for dyslexic students called Fast ForWord, which helps students compensate for the difficulties they have with auditory processing. The scientists behind the software are experimenting to see if it can also help other students without dyslexia build their cognitive “muscles” and take advantage of brain plasticity in the same way that it does for dyslexic students. Increasingly, neuroscience is demonstrating the importance of making learning a fun and positive experience. Pleasurable experiences cause the body to release dopamine, which in turn helps the brain remember facts. One great example of how this is making it into the classroom is Khan Academy, an online learning portal that challenges students to complete games and problem sets in order to win badges. Many students report feeling an affinity for subjects like math and science that they didn’t have before the game-based learning program was implemented in their schools. Even when students didn’t have a marked increase in test scores after using Khan, they reported a more positive attitude about learning, which can often be a major hurdle for educators. Recent research has also shown just how much of an emotional experience learning can be, with negative emotional states like fear, anxiety, shame, or worry making it difficult or impossible for students to reason, learn, or store new memories. This data further stresses the need for developing learning environments that are not just fun but are also positive, safe places for students. Human beings are highly social creatures, so it should come as no surprise that neuroscience would point to a positive effect from social learning experiences. A study by teacher and neurologist Judy Willis in 2011 found that students who worked on writing in positive, supportive groups experienced a surge in dopamine (which we’ve already discussed the positive effects of), as well as a redirection and facilitation of information through the amygdala into the higher cognitive brain, allowing students to better remember information over the long term. She also found that learning in groups tended to reduce anxiety, which can frequently be a major roadblock to effective learning. Some schools have used this study and others like it as the basis for allowing students to do more group work or even to help struggling peers grasp a new concept. We’ve already discussed neuroscience research that has shown us how diverse our brains can be, but research also demonstrates that they are incredibly dynamic. Through practice, it’s actually possible to change the way our brains are structured, adding more brain connections and changing neural pathways through the neuroplasticityafforded by our brain cells. Education is just beginning to acknowledge that successful learning isn’t just a process of taking in facts; it’s also about strengthening and developing the brain itself. These developments can not only help to improve learning in those with disabilities but can also improve memory and language skills in all students, regardless of ability. 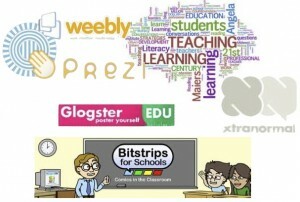 Educators are increasingly encouraging administrators to move away from memorization-based learning to programs that ask students to solve problems, think critically, and explore creativity, as these methods not only build knowledge but also enhance and build brain pathways themselves, prepping the brain for future educational experiences.